My maternal great-uncle Arthur Desgroseilliers was born on 11 July 1901 in St. Charles, Sudbury District, Ontario. The second son of Albert and Clémentine (Léveillé) Desgroseilliers, Arthur had thirteen siblings: ten brothers (including my grandfather Eugène) and three sisters. He was baptised “Ovide-Arthur” on 14 July 1901 by Father G.A. Picotte of St-Thomas Apôtre Church in Warren, Sudbury District, Ontario. I’m not sure if three-day-old Arthur was taken to Warren to be baptised or if Father Picotte travelled to St. Charles to perform the ceremony. It seems more likely that the priest went to St. Charles and then recorded the details in his church’s sacramental register once back in Warren. Arthur’s godparents were Arthur Gervais (husband of his aunt Emma Desgroseilliers) and Euphémie Desgroseilliers (Emma’s younger sister). In June 1911, Arthur was enumerated on that year’s federal census as a 10-year-old boy in his parents’ household. The family lived on concession 2 in Appleby Township in Nipissing District. His father Albert was a farmer, while Arthur and his brother Eugène were school students. 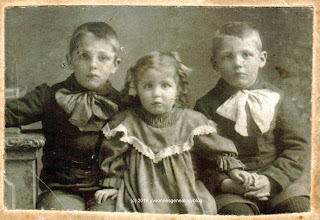 The two boys and their parents could read and write and they all spoke French. About 1917, Arthur and his family moved north to the village of Moonbeam in Cochrane District. His three youngest brothers, Ovide, Ovila and Joseph, were born there. When searching for Arthur on the 1921 census, I found him in two locations. First, he and the Desgroseilliers family were enumerated in one household on lot 12, concession 1 in Fauquier Township, except for Arthur, who’s on lot 14, concession 2. He was a farmer. Second, he was enumerated in his own household in Jackson Bay in nearby Kendrey Township. His home, which he rented, was a one-room wood structure. According to the census, Arthur could not read nor write. He earned $600 as a laborer in the past twelve months. I recently found Arthur’s death registration at Ancestry.ca. It gave his date and place of death as 10 May 1923 in Spruce Falls (Power and Paper) Company Hospital in Kapuskasing, Cochrane District, Ontario. The cause of death was typhoid fever with broncho-pneumonia as a contributory factor. He was ill for at least five days before he succumbed to the disease. In early 1923, a typhoid epidemic was raging in northern Ontario, particularly in the town of Cochrane. Arthur might have become ill by eating or drinking contaminated food or water. Cochrane’s water was compromised that year when “sewage [… was] drawn into the city’s water system”. Alternatively, Arthur might have come into contact with someone affected with the disease in Cochrane or closer to his home. Arthur was buried on 11 May 1923 in Moonbeam. He was only 21 years old (he would turn 22 that July) and unmarried. His death must have been a great loss for his family. 1. St-Thomas Apôtre (Warren, Ontario), parish register, 1901-1967, no page no., entry no. 31 (1901), Ovide-Arthur Desgroseillers (written as Ovide-Arthur Desgroseillers, indexed as Ovide Arthur Desgroseillers) baptism, 14 July 1901; St-Thomas Apôtre parish; digital images, “Ontario, Canada, Catholic Church Records (Drouin Collection), 1747-1967”, Ancestry.ca (http://www.ancestry.ca : accessed 4 February 2016). Also, “Ontario, Canada, Deaths, 1869-1938 and Deaths Overseas, 1939-1947”, digital images, Ancestry.ca (http://www.ancestry.ca : accessed 20 May 2013), entry for Arthur DesGroseilliers (written as Arthur DesGroseilliers, indexed as Arthur Desgroselliers), 10 May 1923; citing Archives of Ontario, Registrations of Deaths, 1869-1938; Toronto, Ontario, Canada: Archives of Ontario; microfilm series MS935, reel 999. 2. St-Thomas Apôtre, parish register, 1901-1967, no page no., Ovide-Arthur Desgroseillers baptism, 14 July 1901. 3. “Ontario, Canada Deaths, 1869-1932”, digital image, Ancestry.ca (http://www.ancestry.ca : accessed 20 January 2012), entry for Alma Degrossalier [sic], 6 July 1907; citing Archives of Ontario, Registrations of Deaths, 1869-1932; Toronto, Ontario, Canada: Archives of Ontario; microfilm series MS935, reel 131. 4. 1911 census of Canada, Appleby, Hawley [Townships], Nipissing, Ontario, population schedule, enumeration district 3, p. 1, dwelling 8, family 8, Albert Deapeniallin (written as Desgros[iallier? ], indexed as Deapeniallin) household; digital images, Ancestry.ca (http://www.ancestry.ca : accessed 9 May 2016); citing Census of Canada, 1911, microfilm reels T-20326 to T-20460; Library and Archives Canada, Ottawa, Ontario, Canada. 5. 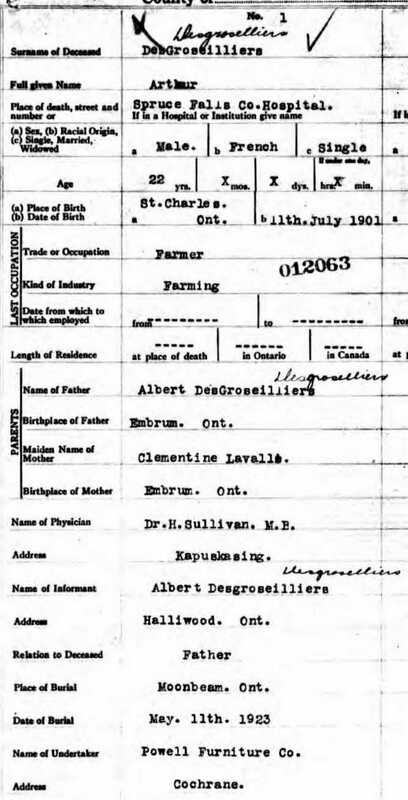 1921 census of Canada, Fauquier Township, Temiskaming, Ontario, population schedule, subdistrict 75, p. 15, dwelling 123, family 123, Albert Desgrosellier (written as Albert Desgrosellier, indexed as Albert Desgroseillier) household; digital images, Ancestry.ca (http://www.ancestry.ca : accessed 9 May 2016); citing Library and Archives Canada, Sixth Census of Canada, 1921; Ottawa, Ontario, Canada: Library and Archives Canada, 2013; Series RG31; Statistics Canada Fonds. 6. 1921 census of Canada, Bradhurn, Syders, Haggart, Kendry, Alexandra (Townships), Temiskaming, Ontario, population schedule, subdistrict 73, p. 2, dwelling 123, family 123, Art DesGroseilliers (written as Art DesGroseilliers, indexed as Art Desgroseillers) household; digital images, Ancestry.ca (http://www.ancestry.ca : accessed 9 May 2016); citing Library and Archives Canada, Sixth Census of Canada, 1921; Ottawa, Ontario, Canada: Library and Archives Canada, 2013; Series RG31; Statistics Canada Fonds. 7. Lionel Séguin, Historique de la paroisse Saint-Charles (Saint-Charles, Ont., 1945: 228); digital images, Our Roots (http://www.ourroots.ca/ : accessed 18 June 2013). 8. 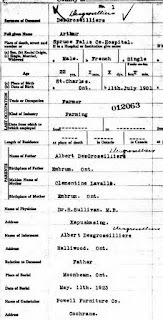 FICHES DE DÉCÈS/SÉPULTURES Kapuskasing DEATH/BURIAL RECORDS 1915 – 2010, database (http://kapuskasingdeathrecords.com/default.htm : accessed 4 February 2016), death entry for Arthur Desgroseilliers, 10 May 1923) and “Ontario, Canada, Deaths, 1869-1938 and Deaths Overseas, 1939-1947”, digital images, Ancestry.ca (http://www.ancestry.ca : accessed 20 May 2013), entry for Arthur DesGroseilliers, 10 May 1923. 9. 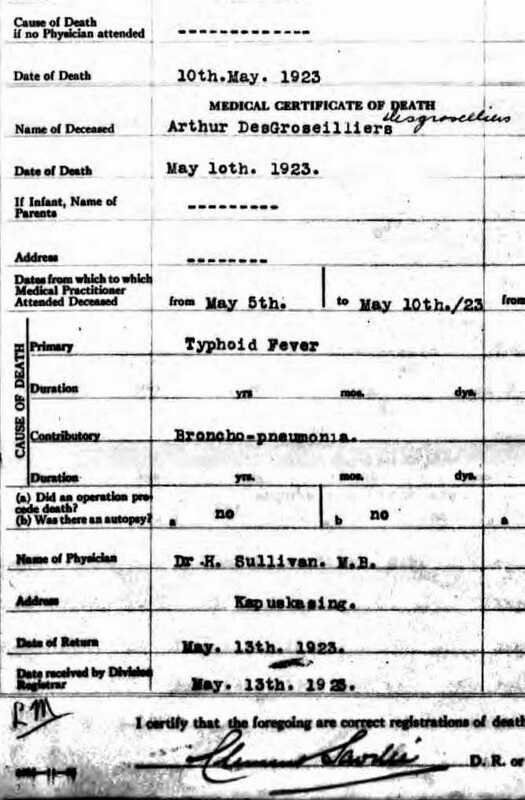 “Ontario, Canada, Deaths, 1869-1938 and Deaths Overseas, 1939-1947”, digital images, Ancestry.ca (http://www.ancestry.ca : accessed 20 May 2013), entry for Arthur DesGroseilliers, 10 May 1923. 10. 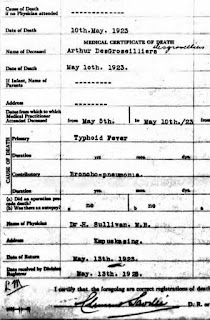 “Typhoid Fever”, database, Mayo Clinic (http://www.mayoclinic.org/diseases-conditions/typhoid-fever/basics/definition/CON-20028553 : accessed 9 May 2016). 11. “Cochrane Has Now 500 Sick; Epidemic Grows”, The Ottawa (Ontario, Canada) Evening Journal, 31 March 1923, p. 1; digital images, Newspapers.com (http://www.newspapers.com : accessed 9 May 2016). 12. “Death List Growing Cochrane Epidemic”, The Ottawa (Ontario, Canada) Evening Journal, 4 April 1923, p. 13; digital images, Newspapers.com (http://www.newspapers.com : accessed 9 May 2016). 13. Forty-second Annual Report of the Provincial Board of Health of Ontario, Canada for the year 1923 (Toronto: Clarkson W. James, 1924, 280 and 54); digital images, University of Toronto (http://scans.library.utoronto.ca/pdf/4/39/ontariodepthealth1923ontauoft/ontariodepthealth1923ontauoft.pdf : accessed 9 May 2016). 14. Forty-second Annual Report of the Provincial Board of Health of Ontario, Canada, 34.